The wedding ceremony is one of the most important romantic rituals of a lifetime. It signifies the passing of two people as individuals and the joining of two people into what can be considered an entirely new entity: a couple bound by love, a lifetime partnership, a family of two. However, what a wedding means can only experienced, primarily, through romance because the wedding only means something if the bride and groom feel something. For the deepest romance, summer weddings can rarely be beaten. That said, romance rarely happens–it must be made. Following are the top seven romantic setups for any summer wedding. A romantic summer wedding on family property need not be expensive. It must, however, evoke a sense of awe, wonder, and beauty. Achieving this takes some imagination and effort, but the main requirement is that the main wedding area be separated, visually, from its surroundings. Professional venues already do this. The reception area is separate, for instance, from the wedding area. The reception room is similarly set apart. However, for a do-it-yourself wedding, where the vows can be spoken under a favorite tree, the entire area should be fenced off from the surrounding area with thin picket fencing and flowers. If picket fencing is not the right style, additional ways to set off the area include building arches and pathways. Arches, for instance, can be strewn with flowers. Pathways can be made with paving stones or by using posts strung with lights or flowers. Regardless of the specific theme or design, the wedding should be visually distinct from the surroundings, an important special area that will never be again experienced but always remembered. In terms of trimming, everything must look elegant, trimmed, and landscaped. Left to its own devices, the outdoors, in general, and family property, in particular, can sometimes appear pretty ragged and wild. For an added touch of romance and wonder, landscape the wedding area. Ensure trees are trimmed for weeds, and make sure sidewalks and pathways are edged. Other areas that need trimming include fence posts and decks. Finally, mow the lawn shorter than the usual height. Doing so will create the appearance of a well-groomed golf course rather than a sod-covered field or yard. Evening weddings are magical. However, they come with their own set of unique problems that must be overcome. Darkness is, of course, the first problem. To solve this, use a mix of festoon lighting, floating candles, and / or trees strewn with soft white lighting. The result is wondrous. Festoon lighting, for instance, is never seen outside of festivities, to it is a distinct way to create the sense of twilight. There will be enough light, so everyone can see. However, the light will be soft, romantic, and warm. If mosquitoes are going to be a problem, do not solve that problem using spray. Literally, the wedding will reek, which is not the intended goal. Instead, use netting. Draping netting over lattice work, arches, or over a pergola or gazebo will deal with mosquitoes while also creating a shady, distinct appearance of a pavilion. Of course, encasing an entire outdoor area in netting is often impossible. For large areas, ensure to spray the yard twice. Spray once eight weeks in advance. Spray again four weeks in advance. Doing so will kill mosquitoes and keep them at bay for up to six months. By the time of the wedding, there will be no lasting odor. Incorporating mutual interests into the wedding is one way to bring each of the betrothed’s identities into the wedding, individualizing it. For instance, if the bride and groom have mutual interests in art, the vows can be said amid favorite pieces of art. If they are interested in writing, for instance, they might say their vows over a blank book, a symbol of their story yet to be written. Whatever their interests, integrating them in small ways will make for a memorable, romantic moment that resonates. Nothing is as romantic as a wedding on the beach. However, for landlocked weddings, bringing the beach to the wedding is also possible. Primary requirements include sand and either a lake or other body of water or even a table-top water fountain. Important accessories include two chairs and two soft brushes. Of course, it might be unfeasible to haul in hundreds of pounds of sand into a wedding. More important, getting rid of all the sand will be a hassle. Some commercial venues, however, have beach-themed properties reserved for weddings. If that is not an option, it is possible to purchase enough sand to create a small area where the bride and groom can remove their shoes and stand (or sit) with their feet in the sand. Doing so will create a tactile memory–forever. Because the space will likely be small, it is best reserved for a single spot, the reception area, perhaps, where the cake is to be cut. Also, it could be at the spot where vows are exchanged. In either instance, the ceremony of removing the shoes and standing in the sand will create a memory to last. Of course, once the vows are spoken, some easy, convenient way to remove the sand from the feet is necessary. This can be done by having the bride sit in her chair while the groom softly brushes off her feet. Then the groom can be seated as the bride brushes off his feet. Sometimes it is best to rent a commercial venue. Also, in the summer, ensuring everyone remains cool and comfortable is important. Renting a venue is the best option for people wanting to not add stress to an already hectic time. When renting a venue, the best way to create a sense of romance is to select a place unlike anything either the bride or groom might experience on a day-to-day basis. In short, the venue should sweep everyone away to another time and place. For instance, a wedding in an indoor flower garden beneath an elegant pavilion is one option. Another is to select a place with unique architecture. Many cities have historic buildings reserved as wedding venues. These might be mansions–or even castles. Other options include a wedding that takes place in front of a wall-sized, streaming water fountain. Whatever the venue, it should be capable of visually transporting everyone away. Boat weddings are, perhaps, one of the best ways to achieve a lasting memory of a romantic moment. 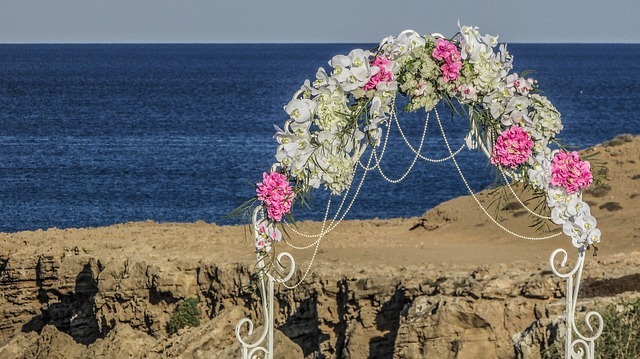 Regardless whether the wedding takes place on the ocean or a lake, the view will be amazing. The key to a boat wedding is to ensure enough time for photos. Also, ensure the the boat has both an indoor and outdoor area for vows. An outdoor area can often be magical. An indoor area can help protect everyone from the wind. The best way to create romance is to create a sense of fantasy and intimacy. For instance, accessories from a bridal store such as Luv Bridal are elegant, graceful, and sensual, capturing the essence of romance. Two of the best wedding dress accessories to create romance include a veil and a garter. Everyone knows about mailing invitations and returning RSVPs. However, few people know about the three sentiments. The “three sentiments” are blank small squares of custom stationery, each with its own envelope. Three squares are given to the bride. Three are given to the groom. Each person writes a brief, romantic sentiment on each of the cards. The sentiments are then placed in the accompanying envelopes and exchanged between one another–but not opened. The moments to open the sentiments should be agreed-upon moments during the wedding where emotion is at its highest. The first, for instance, can be opened as the groom waits for the bride and as the bride prepares to walk down the aisle. The second sentiment can be opened at the alter, together, perhaps, before or after vows. The third can be opened at the cutting of the cake. The idea is to instill some private communication between the bride and groom during an event that is, by and large, extremely public. This exchanging of intimate “I love yous” or any other type of sentiment, in secret, in front of everyone, can be a powerful way to create a spark of lasting romance. The third sentiment should be the most solemn of the three, something true, some private written whisper shared with one’s beloved. Technically, of course, adding accessories can be done in any season. Similarly, the ritual of the three sentiments can take place in any wedding–in any season. However, combined, these types of embellishment are the absolute best ways to add romance in a summer wedding.